"Helsingfors" redirects here. For the village in Västerbotten County, Sweden, see Hälsingfors. For the 2009 Finnish film, see Hellsinki. For the ships, see SS Helsingfors. Helsinki (/ˈhɛlsɪŋki, hɛlˈsɪŋki/, Finnish: [ˈhelsiŋki] ( listen); Swedish: Helsingfors [hɛlsɪŋˈfɔʂː] ( listen)) is the capital and most populous city of Finland. 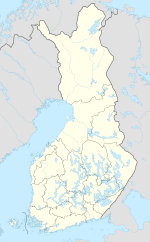 Located on the shore of the Gulf of Finland, it is the seat of the region of Uusimaa in southern Finland, and has a population of 650,058. The city's urban area has a population of 1,268,296, making it by far the most populous urban area in Finland as well as the country's most important center for politics, education, finance, culture, and research. Helsinki is located 80 kilometres (50 mi) north of Tallinn, Estonia, 400 km (250 mi) east of Stockholm, Sweden, and 390 km (240 mi) west of Saint Petersburg, Russia. It has close historical ties with these three cities. Together with the cities of Espoo, Vantaa, and Kauniainen, and surrounding commuter towns, Helsinki forms the Greater Helsinki metropolitan area, which has a population of nearly 1.5 million. Often considered to be Finland's only metropolis, it is the world's northernmost metro area with over one million people as well as the northernmost capital of an EU member state. After Stockholm and Oslo, Helsinki is the third largest municipality in the Nordic countries. The city is served by the international Helsinki Airport, located in the neighboring city of Vantaa, with frequent service to many destinations in Europe and Asia. Helsinki was the World Design Capital for 2012, the venue for the 1952 Summer Olympics, and the host of the 52nd Eurovision Song Contest. Helsinki has one of the highest urban standards of living in the world. In 2011, the British magazine Monocle ranked Helsinki the world's most liveable city in its liveable cities index. In the Economist Intelligence Unit's 2016 liveability survey, Helsinki was ranked ninth among 140 cities. According to a theory presented in the 1630s, at the time of Swedish colonisation of coastal areas of Finland, colonists from Hälsingland in central Sweden had arrived to what is now known as the Vantaa River and called it Helsingå ("Helsinge River"), which gave rise to the names of Helsinge village and church in the 1300s. This theory is questionable, because dialect research suggests that the settlers arrived from Uppland and nearby areas. Others have proposed the name as having been derived from the Swedish word helsing, an archaic form of the word hals (neck), referring to the narrowest part of a river, the rapids. Other Scandinavian cities at similar geographic locations were given similar names at the time, e.g. Helsingør in Denmark and Helsingborg in Sweden. When a town was founded in Forsby village in 1548, it was named Helsinge fors, "Helsinge rapids". The name refers to the Vanhankaupunginkoski rapids at the mouth of the river. The town was commonly known as Helsinge or Helsing, from which the contemporary Finnish name arose. Official Finnish Government documents and Finnish language newspapers have used the name Helsinki since 1819, when the Senate of Finland moved itself into the city from Turku, the former capital of Finland. The decrees issued in Helsinki were dated with Helsinki as the place of issue. This is how the form Helsinki came to be used in written Finnish. As part of the Grand Duchy of Finland in the Russian Empire, Helsinki was known as Gelsingfors in Russian. In Helsinki slang, the city is called Stadi (from the Swedish word stad, meaning "city"). Hesa (short for Helsinki), is not used by natives of the city. Helsset is the Northern Sami name of Helsinki. In the Iron Age the area occupied by present day Helsinki was inhabited by Tavastians. They used the area for fishing and hunting, but due to a lack of archeological finds it is difficult to say how extensive their settlements were. Pollen analysis has shown that there were cultivating settlements in the area in the 10th century and surviving historical records from the 14th century describe Tavastian settlements in the area. Swedes colonized the coastline of the Helsinki region in the late 13th century after the successful Second Crusade to Finland, which led to the defeat of the Tavastians. Helsinki was established as a trading town by King Gustav I of Sweden in 1550 as the town of Helsingfors, which he intended to be a rival to the Hanseatic city of Reval (today known as Tallinn). In order to populate his newly founded town, the King issued an order to resettle the bourgeoisie of Porvoo, Ekenäs, Rauma and Ulvila into the town. Little came of the plans as Helsinki remained a tiny town plagued by poverty, wars, and diseases. The plague of 1710 killed the greater part of the inhabitants of Helsinki. The construction of the naval fortress Sveaborg (in Finnish Viapori, today also Suomenlinna) in the 18th century helped improve Helsinki's status, but it was not until Russia defeated Sweden in the Finnish War and annexed Finland as the autonomous Grand Duchy of Finland in 1809 that the town began to develop into a substantial city. Russians besieged the Sveaborg fortress during the war, and about one quarter of the town was destroyed in an 1808 fire. Russian Emperor Alexander I of Russia moved the Finnish capital from Turku to Helsinki in 1812 to reduce Swedish influence in Finland, and to bring the capital closer to Saint Petersburg. Following the Great Fire of Turku in 1827, the Royal Academy of Turku, which at the time was the country's only university, was also relocated to Helsinki and eventually became the modern University of Helsinki. The move consolidated the city's new role and helped set it on a path of continuous growth. This transformation is highly apparent in the downtown core, which was rebuilt in the neoclassical style to resemble Saint Petersburg, mostly to a plan by the German-born architect C. L. Engel. As elsewhere, technological advancements such as railroads and industrialization were key factors behind the city's growth. Despite the tumultuous nature of Finnish history during the first half of the 20th century (including the Finnish Civil War and the Winter War which both left marks on the city), Helsinki continued its steady development. A landmark event was the 1952 Olympic Games, held in Helsinki. Finland's rapid urbanization in the 1970s, occurring late relative to the rest of Europe, tripled the population in the metropolitan area, and the Helsinki Metro subway system was built. The relatively sparse population density of Helsinki and its peculiar structure have often been attributed to the lateness of its growth. Called the "Daughter of the Baltic", Helsinki is on the tip of a peninsula and on 315 islands. The inner city is located on a southern peninsula, Helsinginniemi (”Helsinki’s peninsula”), which is rarely referred to by its actual name, Vironniemi (”Estonia’s peninsula”). Population density in certain parts of Helsinki's inner city area is comparatively higher, reaching 16,494 inhabitants per square kilometre (42,720/sq mi) in the district of Kallio, but as a whole Helsinki's population density of 3,050 per square kilometre (7,900/sq mi) ranks the city as rather sparsely populated in comparison to other European capital cities. Outside of the inner city, much of Helsinki consists of postwar suburbs separated by patches of forest. A narrow, 10 kilometres (6.2 mi) long Helsinki Central Park, stretching from the inner city to Helsinki's northern border, is an important recreational area for residents. The City of Helsinki has about 11,000 boat berths and possesses over 14,000 hectares (34,595 acres; 54.1 sq mi) of marine fishing waters adjacent to the Capital Region. Some 60 fish species are found in this area and recreational fishing is popular. Major islands in Helsinki include Seurasaari, Vallisaari, Lauttasaari, and Korkeasaari – the lattermost being the site of Finland’s largest zoo. Other noteworthy islands are the fortress island of Suomenlinna (Sveaborg), the military island of Santahamina, and Isosaari. Pihlajasaari island is a favorite summer spot for gay men and naturists, comparable to Fire Island in New York City. The Helsinki metropolitan area, also known as the Capital Region (Finnish: Pääkaupunkiseutu, Swedish: Huvudstadsregionen) comprises four municipalities: Helsinki, Espoo, Vantaa, and Kauniainen. The Helsinki urban area is considered to be the only metropolis in Finland. It has a population of over 1,1 million, and is the most densely populated area of Finland. The Capital Region spreads over a land area of 770 square kilometres (300 sq mi) and has a population density of 1,418 inhabitants per square kilometre (3,670/sq mi). With over 20 percent of the country's population in just 0.2 percent of its surface area, the area's housing density is high by Finnish standards. The Helsinki Metropolitan Area (Greater Helsinki) consists of the cities of Helsinki Capital Region and ten surrounding municipalities. The Metropolitan Area covers 3,697 square kilometres (1,427 sq mi) and has a population of over 1.4 million, or about a fourth of the total population of Finland. The metropolitan area has a high concentration of employment: approximately 750,000 jobs. Despite the intensity of land use, the region also has large recreational areas and green spaces. The Greater Helsinki area is the world's northernmost urban area with a population of over one million people, and the northernmost EU capital city. The Helsinki urban area is an officially recognized urban area in Finland, defined by its population density. The area stretches throughout 11 municipalities, and is the largest such area in Finland, with a land area of 66,931 square kilometres (25,842 sq mi) and approximately 1,2 million inhabitants. Helsinki has a humid continental climate (Köppen: Dfb) similar to that of Hokkaido or Nova Scotia coastal. Owing to the mitigating influence of the Baltic Sea and North Atlantic Current (see also Extratropical cyclone), temperatures during the winter are higher than the northern location might suggest, with the average in January and February around −5 °C (23 °F). Winters in Helsinki are notably warmer than in the north of Finland, and the snow season is much shorter in the capital, due to it being in extreme Southern Finland and the urban heat island effect. Temperatures below −20 °C (−4 °F) occur a few times a year at most. However, because of the latitude, days last 5 hours and 48 minutes around the winter solstice with very low sun (at noon, the sun is a little bit over 6 degrees in the sky), and the cloudy weather at this time of year exacerbates darkness. Conversely, Helsinki enjoys long daylight during the summer; during the summer solstice, days last 18 hours and 57 minutes. The average maximum temperature from June to August is around 19 to 22 °C (66 to 72 °F). Due to the marine effect, especially during hot summer days, daily temperatures are a little cooler and night temperatures higher than further inland. The highest temperature ever recorded in the city centre was 31.6 °C (88.9 °F), on 18 July 1945, and the lowest was −34.4 °C (−30 °F), on 10 January 1987. Unofficial low of -35 was recorded in December 1876. Helsinki Airport (in Vantaa, 17 kilometres (11 mi) north of the Helsinki city centre) recorded a temperature of 33.7 °C (92.7 °F), on 29 July 2010, and a low of −35.9 °C (−33 °F), on 9 January 1987. Precipitation is received from frontal passages and thunderstorms. Thunderstorms are most common in the summer. Climate data for Helsinki Airport (Vantaa) 1981-2010 normals, records 1952- present. The Helsinki Cathedral is among the most prominent buildings in the city. Carl Ludvig Engel, appointed to plan a new city centre on his own, designed several neoclassical buildings in Helsinki. The focal point of Engel's city plan was the Senate Square. It is surrounded by the Government Palace (to the east), the main building of Helsinki University (to the west), and (to the north) the large Helsinki Cathedral, which was finished in 1852, twelve years after Engel's death. Helsinki's epithet, "The White City of the North", derives from this construction era. Helsinki is also home to numerous Art Nouveau-influenced (Jugend in Finnish) buildings belonging to the romantic nationalism trend, designed in the early 20th century and strongly influenced by Kalevala, which was a common theme of the era. Helsinki's Art Nouveau style is also featured in central residential districts, such as Katajanokka and Ullanlinna. An important architect of the Finnish Art Nouveau style was Eliel Saarinen, whose architectural masterpiece was the Helsinki Central Station. Helsinki also features several buildings by Finnish architect Alvar Aalto, recognized as one of the pioneers of architectural functionalism. However, some of his works, such as the headquarters of the paper company Stora Enso and the concert venue Finlandia Hall, have been subject to divided opinions from the citizens. Functionalist buildings in Helsinki by other architects include the Olympic Stadium, the Tennis Palace, the Rowing Stadium, the Swimming Stadium, the Velodrome, the Glass Palace, the Töölö Sports Hall, and Helsinki-Malmi Airport. The sports venues were built to serve the 1940 Helsinki Olympic Games; the games were initially cancelled due to the Second World War, but the venues fulfilled their purpose in the 1952 Olympic Games. Many of them are listed by DoCoMoMo as significant examples of modern architecture. The Olympic Stadium and Helsinki-Malmi Airport are also catalogued by the Finnish National Board of Antiquities as cultural-historical environments of national significance. Helsinki's neoclassical buildings were often used as a backdrop for scenes set to take place in the Soviet Union in many Cold War era Hollywood movies, when filming in the USSR was not possible. Some of them include The Kremlin Letter (1970), Reds (1981), and Gorky Park (1983). Because some streetscapes were reminiscent of Leningrad's and Moscow's old buildings, they too were used in movie productions. At the same time the government secretly instructed Finnish officials not to extend assistance to such film projects. The start of the 21st century marked the beginning of highrise construction in Helsinki. In the 21st century Helsinki has decided to allow the construction of skyscrapers. As of April 2017 there are no skyscrapers taller than 100 meters in the Helsinki area, but there are several projects under construction or planning, mainly in Pasila and Kalasatama. An international architecture competition for at least 10 high-rises to be built in Pasila is being held. Construction of the towers will start before 2020. In Kalasatama, the first 35-story (130 m, 427 ft) and 32-story (122 m, 400 ft) residential towers are already under construction. Later they will be joined by a 37-story (140 metres, 459 ft), two 32-story (122 metres, 400 feet), 31-story (120 metres, 394 ft), and 27-story (100 metres, 328 ft) residential buildings. In the Kalasatama area, there will be about 15 high-rises within 10 years. A panoramic view over the southernmost districts of Helsinki from Hotel Torni. The Helsinki Old Church and its surrounding park are seen in the foreground, while the towers of St. John's Church (near center) and Mikael Agricola Church (right) can be seen in the middle distance, backdropped by the Gulf of Finland. As is the case with all Finnish municipalities, Helsinki's city council is the main decision-making organ in local politics, dealing with issues such as urban planning, schools, health care, and public transport. The council is chosen in the nationally-held municipal elections, which are held every four years. Helsinki's city council consists of eighty-five members. Following the most recent municipal elections in 2017, the three largest parties are the National Coalition Party (25), the Green League (21), and the Social Democratic Party (12). The Mayor of Helsinki is Jan Vapaavuori. At 53 percent of the population, women form a greater proportion of Helsinki residents than the national average of 51 percent. Helsinki's population density of 2,739.36 people per square kilometre makes Helsinki the most densely-populated city in Finland. The life expectancy for men and women is slightly below the national averages: 75.1 years for men as compared to 75.7 years, 81.7 years for women as compared to 82.5 years. Helsinki has experienced strong growth since the 1810s, when it replaced Turku as the capital of the Grand Duchy of Finland, which later became the sovereign Republic of Finland. The city continued its growth from that time on, with an exception during the Finnish Civil War. From the end of World War II up until the 1970s there was a massive exodus of people from the countryside to the cities of Finland, in particular Helsinki. Between 1944 and 1969 the population of the city nearly doubled from 275,000 to 525,600. In the 1960s, the population growth of Helsinki began to decrease, mainly due to a lack of housing. Some residents began to move to the neighbouring cities of Espoo and Vantaa, resulting in increased population growth in both municipalities. Espoo's population increased ninefold in sixty years, from 22,874 people in 1950 to 244,353 in 2009. Vantaa saw an even more dramatic change in the same time span: from 14,976 in 1950 to 197,663 in 2009, a thirteenfold increase. These population changes prompted the municipalities of Greater Helsinki into more intense cooperation in areas such as public transportation – resulting in the foundation of HSL – and waste management. The increasing scarcity of housing and the higher costs of living in the capital region have pushed many daily commuters to find housing in formerly rural areas, and even further, to cities such as Lohja, Hämeenlinna, Lahti, and Porvoo. 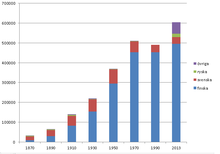 The population broken down by language group, 1870–2013. During the period, the population increased significantly, and the city changed its linguistic majority from Swedish to Finnish. Finnish and Swedish are the official languages of Helsinki. 79.1% of the citizens speak Finnish as their native language. 5.7% speak Swedish. The remaining 15.3% of the population speaks a native language other than Finnish or Swedish. Helsinki slang is a regional dialect of the city. It combines influences mainly from Finnish and English, and has traditionally had strong Russian and Swedish influences. Finnish today is the common language of communication between Finnish speakers, Swedish speakers, and speakers of other languages (New Finns) in day-to-day affairs in the public sphere between unknown persons. Swedish is commonly spoken in city or national agencies specifically aimed at Finland-Swedish speakers, such as the Social Services Department on Hämeentie or the Luckan Cultural centre in Kamppi. Knowledge of Finnish is also essential in business and is usually a basic requirement in the employment market. Finnish speakers surpassed Swedish speakers in 1890 to become the majority of the city's population. At the time, the population of Helsinki was 61,530. As the crossroads of many international ports and Finland's largest airport, Helsinki is the global gateway to and from Finland. The city has Finland's largest immigrant population in both absolute and relative terms. There are over 140 nationalities represented in Helsinki. Foreign citizens make up 9.5% of the population, while the total immigrant population makes up 15.5%. In 2017, 98,269 residents spoke a native language other than Finnish, Swedish, or one of the three Sami languages spoken in Finland. The largest groups of residents not of Finnish background come from Russia (14,532), Estonia (9,065), and Somalia (6,845). One third of Finland's immigrant population lives in the city of Helsinki. The number of people with a foreign mother tongue is expected to be 170,000 in 2030, or 23% of the population. Greater Helsinki generates approximately one third of Finland's GDP. GDP per capita is roughly 1.3 times the national average. Helsinki profits on serviced-related IT and public sectors. Having moved from heavy industrial works, shipping companies also employ a substantial number of people. The metropolitan area's gross value added per capita is 200% of the mean of 27 European metropolitan areas, equalling those of Stockholm and Paris. The gross value added annual growth has been around 4%. 83 of the 100 largest Finnish companies have their headquarters in Greater Helsinki. Two-thirds of the 200 highest-paid Finnish executives live in Greater Helsinki and 42% in Helsinki. The average income of the top 50 earners was 1.65 million euro. The tap water is of excellent quality and it is supplied by 120 km (75 mi) long Päijänne Water Tunnel, one of the world's longest continuous rock tunnels. The Temppeliaukio Church is a Lutheran church in the Töölö neighborhood of the city. The church was designed by architects and brothers Timo and Tuomo Suomalainen and opened in 1969. Built directly into solid rock, it is also known as the Church of the Rock and Rock Church. Haaga-Helia University of Applied Sciences is the largest business polytechnic in Finland. Helsinki has 190 comprehensive schools, 41 upper secondary schools, and 15 vocational institutes. Half of the 41 upper secondary schools are private or state-owned, the other half municipal. Higher level education is given in eight universities (see the section "Universities" below) and four polytechnics. Helsinki is one of the co-location centres of the Knowledge and Innovation Community (Future information and communication society) of The European Institute of Innovation and Technology (EIT). The biggest historical museum in Helsinki is the National Museum of Finland, which displays a vast historical collection from prehistoric times to the 21st century. The museum building itself, a national romantic style neomedieval castle, is a tourist attraction. Another major historical museum is the Helsinki City Museum, which introduces visitors to Helsinki's 500-year history. The University of Helsinki also has many significant museums, including the Helsinki University Museum "Arppeanum" and the Finnish Museum of Natural History. The Finnish National Gallery consists of three museums: Ateneum Art Museum for classical Finnish art, Sinebrychoff Art Museum for classical European art, and Kiasma Art Museum for modern art, in a building by architect Steven Holl. The old Ateneum, a neo-Renaissance palace from the 19th century, is one of the city's major historical buildings. All three museum buildings are state-owned through Senate Properties. The city of Helsinki hosts its own art collection in the Helsinki Art Museum (HAM), primarily located in its Tennispalatsi gallery. Pieces outside of Tennispalatsi include about 200 public art pieces and all art held in property owned by the city. The Design Museum is devoted to the exhibition of both Finnish and foreign design, including industrial design, fashion, and graphic design. Other museums in Helsinki include the Military Museum of Finland, Didrichsen Art Museum, Amos Rex Art Museum, and the Tram Museum. Helsinki has three major theatres: The Finnish National Theatre, the Helsinki City Theatre, and the Swedish Theatre (Svenska Teatern). Other notable theatres in the city include the Alexander Theatre, Q-teatteri, Savoy Theatre, KOM-theatre, and Teatteri Jurkka. Helsinki is home to two full-size symphony orchestras, the Helsinki Philharmonic Orchestra and the Finnish Radio Symphony Orchestra, both of which perform at the Helsinki Music Centre concert hall. Acclaimed contemporary composers Kaija Saariaho, Magnus Lindberg, Esa-Pekka Salonen, and Einojuhani Rautavaara, among others, were born and raised in Helsinki, and studied at the Sibelius Academy. The Finnish National Opera, the only full-time, professional opera company in Finland, is located in Helsinki. The opera singer Martti Wallén, one of the company's long-time soloists, was born and raised in Helsinki, as was mezzo-soprano Monica Groop. Many widely renowned and acclaimed bands have originated in Helsinki, including Hanoi Rocks, HIM, Stratovarius, The 69 Eyes, Finntroll, Ensiferum, Wintersun, The Rasmus, Poets of the Fall, and Apocalyptica. The city's main musical venues are the Finnish National Opera, the Finlandia concert hall, and the Helsinki Music Centre. The Music Centre also houses a part of the Sibelius Academy. Bigger concerts and events are usually held at one of the city's two big ice hockey arenas: the Hartwall Arena or the Helsinki Ice Hall. Helsinki has Finland's largest fairgrounds, the Messukeskus Helsinki. Helsinki Arena hosted the Eurovision Song Contest 2007, the first Eurovision Song Contest arranged in Finland, following Lordi's win in 2006. The Helsinki Festival is an annual arts and culture festival, which takes place every August (including the Night of the Arts). Vappu is an annual carnival for students and workers. At the Senate Square in fall 2010, Finland's largest open-air art exhibition to date took place: About 1.4 million people saw the international exhibition of United Buddy Bears. Helsinki was the 2012 World Design Capital, in recognition of the use of design as an effective tool for social, cultural, and economic development in the city. In choosing Helsinki, the World Design Capital selection jury highlighted Helsinki's use of 'Embedded Design', which has tied design in the city to innovation, "creating global brands, such as Nokia, Kone, and Marimekko, popular events, like the annual Helsinki Design Week, outstanding education and research institutions, such as the Aalto University School of Arts, Design and Architecture, and exemplary architects and designers such as Eliel Saarinen and Alvar Aalto". Helsinki hosts many film festivals. Most of them are small venues, while some have generated interest internationally. The most prolific of these is the Love & Anarchy film festival, also known as Helsinki International Film Festival, which features films on a wide spectrum. Night Visions, on the other hand, focuses on genre cinema, screening horror, fantasy, and science fiction films in very popular movie marathons that last the entire night. Another popular film festival is DocPoint, a festival that focuses solely on documentary cinema. Today,[when?] there are around 200 newspapers, 320 popular magazines, 2,100 professional magazines, 67 commercial radio stations, three digital radio channels, and one nationwide and five national public service radio channels. Sanoma publishes Finland's journal of record, Helsingin Sanomat, the tabloid Ilta-Sanomat, the commerce-oriented Taloussanomat, and the television channel Nelonen. Another Helsinki-based media house, Alma Media, publishes over thirty magazines, including the newspaper Aamulehti, the tabloid Iltalehti, and the commerce-oriented Kauppalehti. Finland's national public-broadcasting institution Yle operates five television channels and thirteen radio channels in both national languages. Yle is headquartered in the neighbourhood of Pasila. All TV channels are broadcast digitally, both terrestrially and on cable. The commercial television channel MTV3 and commercial radio channel Radio Nova are owned by Nordic Broadcasting (Bonnier and Proventus Industrier). The Helsinki Olympic Stadium was the centre of activities during the 1952 Summer Olympics. Helsinki has a long tradition of sports: the city gained much of its initial international recognition during the 1952 Summer Olympics, and the city has arranged sporting events such as the first World Championships in Athletics 1983 and 2005, and the European Championships in Athletics 1971, 1994, and 2012. Helsinki hosts successful local teams in both of the most popular team sports in Finland: football and ice hockey. Helsinki houses HJK Helsinki, Finland's largest and most successful football club, and IFK Helsingfors, their local rivals with 7 championship titles. The fixtures between the two are commonly known as Stadin derby. Helsinki's track and field club Helsingin Kisa-Veikot is also dominant within Finland. Ice hockey is popular among many Helsinki residents, who usually support either of the local clubs IFK Helsingfors (HIFK) or Jokerit. HIFK, with 14 Finnish championships titles, also plays in the highest bandy division, along with Botnia-69. The Olympic stadium hosted the first ever Bandy World Championship in 1957. Helsinki was elected host-city of the 1940 Summer Olympics, but due to World War II they were canceled. Instead Helsinki was the host of the 1952 Summer Olympics. The Olympics were a landmark event symbolically and economically for Helsinki and Finland as a whole that was recovering from the winter war and the continuation war fought with the Soviet Union. Helsinki was also in 1983 the first ever city to host the World Championships in Athletics. Helsinki also hosted the event in 2005, thus also becoming the first city to ever host the Championships for a second time. The Helsinki City Marathon has been held in the city every year since 1980, usually in August. A Formula 3000 race through the city streets was held on 25 May 1997. In 2009 Helsinki was host of the European Figure Skating Championships, and in 2017 it hosted World Figure Skating Championships. The backbone of Helsinki's motorway network consists of three semicircular beltways, Ring I, Ring II, and Ring III, which connect expressways heading to other parts of Finland, and the western and eastern arteries of Länsiväylä and Itäväylä respectively. While variants of a Keskustatunneli tunnel under the city centre have been repeatedly proposed, as of 2017[update] the plan remains on the drawing board. Helsinki has some 390 cars per 1000 inhabitants. This is less than in cities of similar population and construction density, such as Brussels' 483 per 1000, Stockholm's 401, and Oslo's 413. The Helsinki Central Railway Station is the main terminus of the rail network in Finland. Two rail corridors lead out of Helsinki, the Main Line to the north (to Tampere, Oulu, Rovaniemi), and the Coastal Line to the west (to Turku). The railway connection to the east branches from the Main Line outside of Helsinki at Kerava, and leads via Lahti to eastern parts of Finland and to Russia. A majority of intercity passenger services in Finland originate or terminate at the Helsinki Central Railway Station. All major cities in Finland are connected to Helsinki by rail service, with departures several times a day. The most frequent service is to Tampere, with more than 25 intercity departures per day as of 2017. There are international services from Helsinki to Saint Petersburg and to Moscow in Russia. The Saint Petersburg to Helsinki route is operated with the Allegro high-speed trains. A Helsinki to Tallinn Tunnel has been proposed and agreed upon by representatives of the cities. The rail tunnel would connect Helsinki to the Estonian capital Tallinn, further linking Helsinki to the rest of continental Europe by Rail Baltica. Air traffic is handled primarily from Helsinki Airport, located approximately 17 kilometres (11 mi) north of Helsinki's downtown area, in the neighbouring city of Vantaa. Helsinki's own airport, Helsinki-Malmi Airport, is mainly used for general and private aviation. Charter flights are available from Hernesaari Heliport. Like many other cities, Helsinki was deliberately founded at a location on the sea in order to take advantage of shipping. The freezing of the sea imposed limitations on sea traffic up to the end of the 19th century. But for the last hundred years, the routes leading to Helsinki have been kept open even in winter with the aid of icebreakers, many of them built in the Helsinki Hietalahti shipyard. The arrival and departure of ships has also been a part of everyday life in Helsinki. Regular route traffic from Helsinki to Stockholm, Tallinn, and Saint Petersburg began as far back as 1837. Over 300 cruise ships and 360,000 cruise passengers visit Helsinki annually. There are international cruise ship docks in South Harbour, Katajanokka, West Harbour, and Hernesaari. Helsinki is the second busiest passenger port in Europe with approximately 11 million passengers in 2013. Ferry connections to Tallinn, Mariehamn, and Stockholm are serviced by various companies. Finnlines passenger-freight ferries to Gdynia, Poland; Travemünde, Germany; and Rostock, Germany are also available. St. Peter Line offers passenger ferry service to Saint Petersburg several times a week. In the Helsinki metropolitan area, public transportation is managed by the Helsinki Regional Transport Authority, the metropolitan area transportation authority. The diverse public transport system consists of trams, commuter rail, the metro, bus lines, two ferry lines and a public bike system. Helsinki's tram system has been in operation with electric drive continuously since 1900. 13 routes that cover the inner part of the city are operated. As of 2017, the city is expanding the tram network, with several major tram line construction projects under way. These include the 550 trunk line (Raide-Jokeri), roughly along Ring I around the city center, and a new tramway to the island of Laajasalo. The Helsinki Metro, opened in 1982, is the only metro system in Finland, albeit the Helsinki commuter rail trains operate at metro-like frequencies. In 2006, the construction of the long debated extension of the metro into Western Helsinki and Espoo was approved. The extension finally opened after delays in November 2017. An eastern extension into the planned new district of Östersundom and neighboring Sipoo has also been seriously debated. Helsinki's metro system currently consists of 25 stations, with 14 of them underground. The commuter rail system includes purpose-built double track for local services in two rail corridors along intercity railways, and the Ring Rail Line, an urban double-track railway with a station at the Helsinki Airport in Vantaa. Electric operation of commuter trains was first begun in 1969, and the system has been gradually expanded since. 15 different services are operated as of 2017, some extending outside of the Helsinki region. The frequent services run at a 10-minute headway in peak traffic. ^ a b Ainiala, Terhi (2009). "Place Names in the Construction of Social Identities: The Uses of Names of Helsinki". Research Institute for the Languages of Finland. Retrieved 22 September 2011. ^ "Area of Finnish Municipalities 1.1.2018" (PDF). National Land Survey of Finland. Retrieved 30 January 2018. ^ "Suomen virallinen tilasto (SVT): Väestön ennakkotilasto [verkkojulkaisu]. Tammikuu 2019" (in Finnish). Statistics Finland. Retrieved 15 March 2019. ^ "Population according to language and the number of foreigners and land area km2 by area as of 31 December 2008". Statistics Finland's PX-Web databases. Statistics Finland. Retrieved 29 March 2009. ^ "Population according to age and gender by area as of 31 December 2008". Statistics Finland's PX-Web databases. Statistics Finland. Retrieved 28 April 2009. ^ "List of municipal and parish tax rates in 2011". Tax Administration of Finland. 29 November 2010. Retrieved 13 March 2011. ^ "Helsinki". The American Heritage Dictionary of the English Language (5th ed.). Boston: Houghton Mifflin Harcourt. 2014. ^ "Helsinki". Collins English Dictionary. HarperCollins. ^ "Ennakkoväkiluku sukupuolen mukaan alueittain, maaliskuu.2016" (in Finnish). Statistics Finland. Retrieved 31 March 2016. ^ "Taulukko: Taajamat väkiluvun ja väestöntiheyden mukaan 31.12.2017" (in Finnish). 31 December 2017. Retrieved 7 October 2018. ^ "Cities of Finland". Eurostat. Archived from the original on 18 May 2013. Retrieved 10 February 2013. ^ a b "Past capital: Helsinki". Worlddesigncapital.com. Retrieved 19 May 2015. ^ "Most liveable city: Helsinki — Monocle Film / Affairs". Monocle.com. Retrieved 12 March 2013. ^ Salminen, Tapio (2013). Vantaan ja Helsingin pitäjän keskiaika [The Middle-age in Vantaa and Helsinki] (in Finnish). Vantaa. ISBN 978-952-443-455-3. ^ Hellman, Sonja (7 June 2015). "Historiska fel upprättas i ny bok" [Historical misinformation corrected in new book]. Hufvudstadsbladet (in Swedish). ^ "Utbildning & Vetenskap: Svenskfinland". Veta.yle.fi. Archived from the original on 12 May 2008. Retrieved 8 July 2009. ^ "Onko kosken alkuperäinen nimi Helsinginkoski vai Vanhankaupunginkoski?". Helsinginkoski. Retrieved 26 February 2016. ^ Jäppinen, Jere (2007). "Helsingin nimi" (PDF). www.helsinginkaupunginmuseo.fi. Helsingin kaupunginmuseo. Retrieved 26 February 2016. ^ Jäppinen, Jere (15 November 2011). "Mistä Helsingin nimi on peräisin?". Helsingin Sanomat: D2. ^ Ristkari, Maiju: Heinäsorsat Helsingissä. Aku Ankka #44/2013, introduction on page 2. ^ "Sami Grammar". uta.fi. Retrieved 2 January 2015. ^ a b V.-P. Suhonen and Janne Heinonen. "Helsingin keskiaikaiset ja uuden ajan alun kylänpaikat 2011, Inventointiraportti. Museovirasto, Arkeologiset kenttäpalvelut" (PDF). ^ Tarkiainen, Kari (2010). Ruotsin itämaa. Helsinki: Svenska litteratussällskapet i Finland. pp. 122–125. ^ a b "Ruttopuisto – Plague Park". Tabblo.com. Archived from the original on 11 April 2008. Retrieved 3 November 2008. ^ "Helsingin historia". Helsingin kaupunki (in Finnish). ^ Niukkanen, Marianna; Heikkinen, Markku. "Vuoden 1808 suurpalo". Kurkistuksia Helsingin kujille (in Finnish). National Board of Antiquities. Retrieved 14 July 2013. ^ "8 April 1812 Emperor Alexander I promotes Helsinki to the capital of the Grand Duchy. - Helsinki 200 years as capital". ^ "Geography of Helsinki, Overview of Finland". easyexpat.com. Retrieved 5 February 2014. ^ "Helsinki — School of Computer Science — SOCS". McGill University. Retrieved 5 February 2014. ^ "Aluejaot". Tietopalvelu (in Finnish). Uudenmaan liitto. Archived from the original on 29 May 2014. Retrieved 29 May 2014. ^ "Uudenmaan maakuntakaava selostus" (PDF) (in Finnish). Helsinki-Uusimaa Region. Archived from the original (PDF) on 13 August 2011. Retrieved 17 February 2014. ^ "Helsingin seutu tiivistetysti". Kaupunkitieto (in Finnish). Helsinginseutu.fi. ^ "Climate Helsinki: Temperature, Climograph, Climate table for Helsinki - Climate-Data.org". en.climate-data.org. Retrieved 17 January 2018. ^ "Climatological statistics for the normal period 1971–2000". Fmi.fi. Retrieved 13 April 2010. ^ Tukiainen, Matti. "Helsinki, Finland – Sunrise, sunset, dawn and dusk times around the World!". Gaisma. Retrieved 11 February 2011. ^ "FMI open data". FMI. Retrieved 31 March 2018. ^ "FMI normals 1981-2010" (PDF). Fmi.fi. Retrieved 26 April 2016. ^ "Stora Enson pääkonttori, Kanavaranta 1". "Helsingin Aallot" blog (in Finnish). 25 February 2007. Retrieved 5 February 2011. ^ "Kohtaako Enson konttori voittajansa?". Helsingin Sanomat (in Finnish). 14 June 2008. Lead editorial. Retrieved 5 February 2011. ^ Penttilä, Vappu. "Kiasma nousi inhokkien ykköseksi". Verkkoliite (in Finnish). Helsingin Sanomat. Archived from the original on 29 June 2011. Retrieved 5 February 2011. ^ Willis, David K. (4 August 1983). "When it comes to films on Russia, they've seen enough" – via Christian Science Monitor. ^ "Helsingin vaalipiiri — Tulospalvelu — Kuntavaalit 2012". Vaalikone.fi. Archived from the original on 1 January 2013. Retrieved 12 March 2013. ^ Tapani Valkonen ym. (17 December 2007). "Tutkimuksia 10/2007: Elinajanodotteen kehitys Helsingissä ja sen väestönosaryhmissä 1991–2005" (PDF). Helsingin kaupunki, tietokeskus. Retrieved 30 December 2007. ^ Tilastolaitoksen historiaa. "Tilasto". Stat.fi. Retrieved 13 April 2010. ^ "Helsingin historia". Hel.fi. Retrieved 13 April 2010. ^ "Maan alle". Aatos.fi. 30 December 1972. Retrieved 13 April 2010. ^ Butzin, Bernhard (1991). "Helsinki — aspects of urban development and planning". GeoJournal. Springer, Netherlands. 2 (1): 11–26. doi:10.1007/BF00212573. ISSN 0343-2521. ^ "HSL Helsingin seudun liikenne – About HSL". Hsl.fi. 1 January 2010. Archived from the original on 19 January 2010. Retrieved 13 April 2010. ^ "HSY – Default". Hsy.fi. Retrieved 13 April 2010. ^ "General information on Helsinki". Helsinki City. ^ "Immigrants Learning Swedish over Finnish Run into Problems | News | YLE Uutiset". yle.fi. Retrieved 16 September 2011. ^ "Helsingin nimistön vaiheita". Scripta.kotus.fi. Retrieved 13 April 2010. ^ "Kysy.fi | Helsingin kaupunginkirjasto" (in Finnish). Igs.kirjastot.fi. Archived from the original on 4 May 2012. Retrieved 17 February 2014. ^ a b "12 06 28 Tilastoja 23 Peuranen" (PDF) (in Finnish). City of Helsinki. Retrieved 17 February 2014. ^ Katriina Pajari (7 December 2008). "Kolmannes maahanmuuttajista asuu Helsingissä – HS.fi – Kaupunki". HS.fi. Archived from the original on 17 February 2014. Retrieved 13 April 2010. ^ "Helsinki Region Statistics". Helsinginseutu.fi. Retrieved 17 February 2014. ^ "Economy of Helsinki, Finland | Helsinki.com". www.helsinki.com. Retrieved 15 November 2018. ^ "Kansilehti2.vp" (PDF). Retrieved 13 April 2010. ^ "Helsingin Sanomat – International Edition – Metro". Hs.fi. 9 November 2005. Retrieved 8 July 2009. ^ "Temppeliaukio Church in Helsinki", Retrieved 5 September 2012. ^ "Rock church (Temppeliaukio)". Helsinki parishes. Archived from the original on 20 January 2015. Retrieved 20 January 2015. ^ "European Institute of Innovation and Technology: Home". Eit.europa.eu. Archived from the original on 28 March 2010. Retrieved 13 April 2010. ^ "Eurovision Song Contest 2007 Final". eurovision.tv. Retrieved 8 November 2016. ^ "Helsinki Festival". Retrieved 8 November 2016. ^ "United Buddy Bears in Helsinki". Retrieved 1 April 2019. ^ "Helsinki International Film Festival". hiff.fi. Retrieved 21 January 2015. ^ "DocPoint". docpoint.info. Retrieved 21 January 2015. ^ "Night Visions Film Festival". Nightvisions.info. Retrieved 21 January 2015. ^ "The Finnish Bandy Federation". Retrieved 2 April 2016. ^ "World Figure Skating Championships 2017". ^ "Runge" (PDF). European Academy of the Urban Environment. Archived from the original (PDF) on 25 June 2008. Retrieved 17 February 2014. ^ "Tietokeskus: suunnatframe". Hel2.fi. Retrieved 8 July 2009. ^ "Helsinki-Tallinn tunnel proposals look to bring cities closer than ever". The Guardian. 6 January 2016. ^ Feargus O'Sullivan (7 January 2016). "Helsinki and Tallinn Agree to Build the World's Longest Underwater Rail Tunnel". CityLab. ^ "Länsimetro rakentaa tulevaisuutta turvallisesti". Lansimetro.fi. Retrieved 17 February 2014. ^ "Metro extension finally launched – commuters rejoice, experts cautious". Yle. Retrieved 26 November 2017. ^ a b c d e f g "International Relations". Hel.fi. City of Helsinki. Retrieved 11 June 2017. Helsinki’s main bilateral city partners are St. Petersburg, Tallinn, Stockholm and Berlin. In addition, Helsinki maintains special long-term partnerships with Beijing and Moscow. Helsinki has no official sister cities. Helsinki primarily works with other capitals. ^ Yan, Yangtze (14 July 2006). "Beijing, Helsinki forge sister city relationship". Gov.cn. Chinese Government. Retrieved 5 August 2013.